Note: Anyone can type on the internet making unverified reviews of a company and through their own perspective. — Being a former Firefighter/Paramedic and now Medical Doctor graduate I’ve seen an alarming amount of people on psychiatric medications in medical school rotations: Anxiety meds , depressant meds (1 out every 9 Americans are on) , psychosis meds and many people are very miserable. We have on average of about 3-10 harassment phone calls a day. Many of them are pranks, others are very cheap/demanding people that expect customer service to stay on the phone all day and answer irrelevant to our business questions or offer them assistance with searching for other businesses. Some of these customers get very upset when we say the word no and then these over the phone only customers bully and share their anger on the internet. 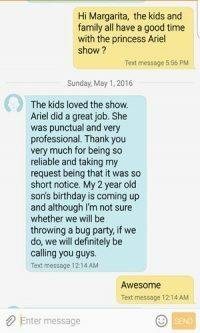 LOOK AT OUR WEBSITE AND YOU TUBE CHANNEL VIDEOS to see how many smiling families, those are legitimate reviews in itself. 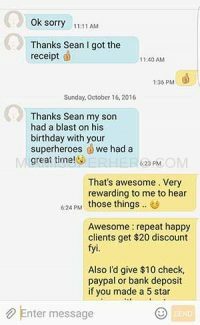 The owner will not tolerate poor behavior no matter what threats are made by customers over the phone this included bad customers that have attempted to extort the company for money or they will do bad reviews. — Many competitors hate my success as a company – their evil hate causes them to leave fraudulent reviews on sites that don’t require any PROOF e.g. 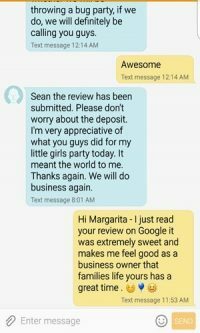 ripoff report , yelp , even the BBB doesn’t require any proof of a review (BBB even tries to get companies to pay $650 a year to be credited in the attempt to exploit small companies without accountability to defend small companies versus unproven reviews. 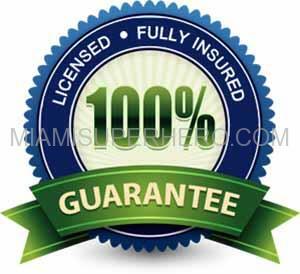 These sites love you because its free banter that makes them money for advertisement so they don’t test for validity. 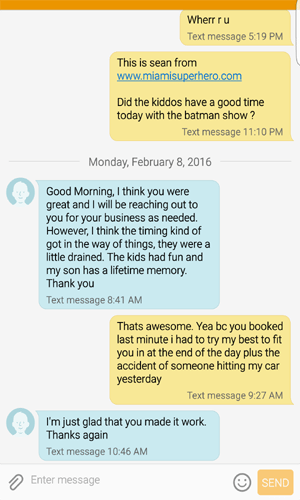 Some Lawyers unethical behavior post fraudulent negative reviews so then the company has to hire them for reputation service to remove the unverified review. — Business Week and Business Atlantic states that people on the phone or online can be 5 times angrier on average in dealing with normal negotiations, discussions and business related conversations. Meaning, people tend to positively modify their behavior in person versus on the phone or online. — Everyday, we typically get at least 1-4 ADULT uncontrolled emotional outburst. These are adults that can’t control their emotions, which is more common than most would think. 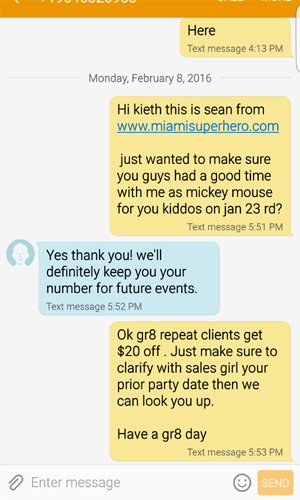 Most of the time these same emotionally unstable individuals begin to threaten the company with bad reviews if we don’t meet their demands like dropping the price, talking for an alarming amount of time on the phone, not hanging up with another client on the other line, not giving our personal office address, not following our standard operating procedures to reserve a Miami superhero party character (Epidemic of fraudulent credit card disputes is another trend stated by business week) and not wanting to pay a park vendor fee which would require me to be a millionaire given there is about 5000 parks in south Florida. 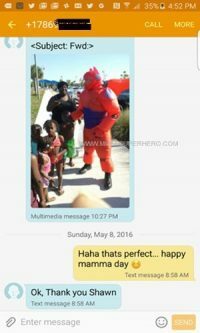 These people attempt to extort or blackmail small companies and business week states this is becoming a EPIDEMIC. 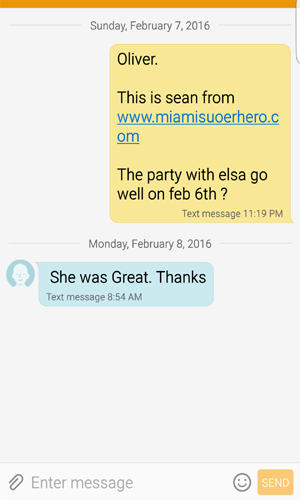 This is a review of a Feb 6, 2016 party with princess Elsa in Miami Beach for client Oliver in zipcode 33140 . Of course we cant provide you their personal info but as one can see another good turn out. 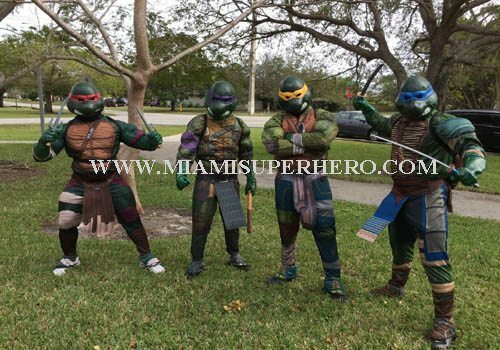 Simple thanks for www.miamisuperhero.com reviews bringing life to parties. 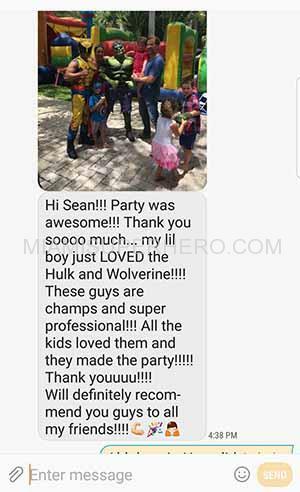 Above , sean thanks again my brother for an amazing event planning for all my family and friends. You know we will be getting you again. 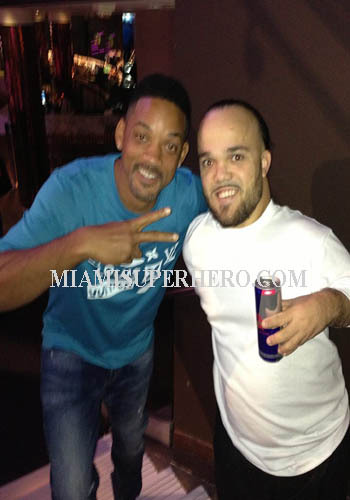 Pit Bull 305 Miami !!!!!!! 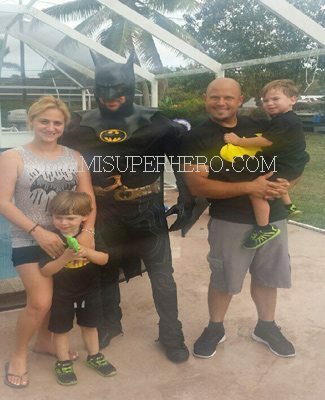 Above Feb 6, 2016 last minute ordering of a Batman party just before the super bowl game – party was in Sunrise at a park. It was cold out but the party went well as the owner made it there instead of going to a super bowl party. Happy birthday , Dayton little Batman Jr. 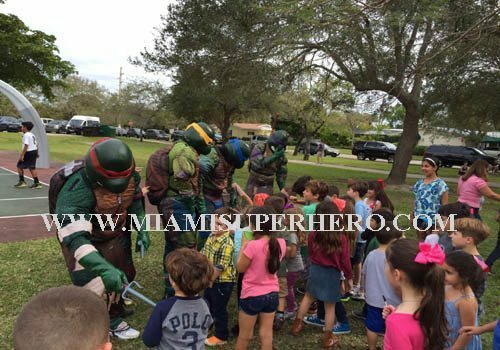 Above Jan 23, 2016 www.miamisuperhero.com review of a Mickey Mouse party for kids. 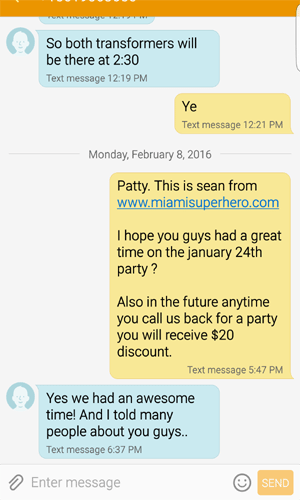 Above Jan 24th, 2016 party reviews for miamisuperhero.com company. 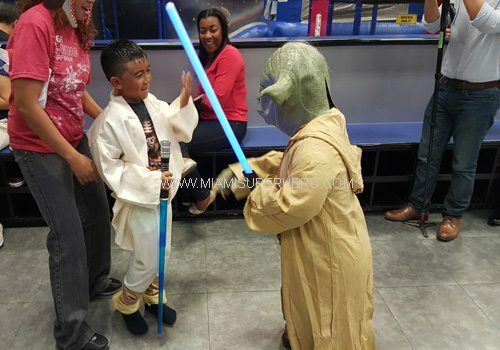 Sean , this is Jeff , the Star-wars party was fantastic. The guys are know to a lot of hits from the kids , I really appreciate your patience and apologize for some of the kids behavior. The kids loved the show and more importantly my son loved the show. His favorite character is Darth Vader and loved the BREATHING APPARATUS sound. 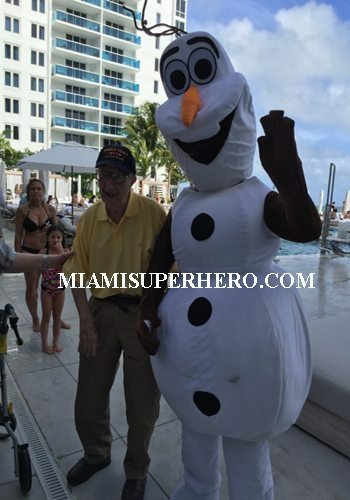 Thanks for the wonderful Princess Elsa show at the One Hotel in Miami Beach on December 26th , 2015 day after Christmas. 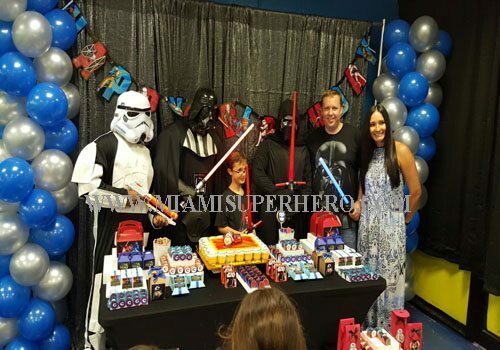 All the guest loved the princess appearance , it seems princess Elsa is known all over the world. 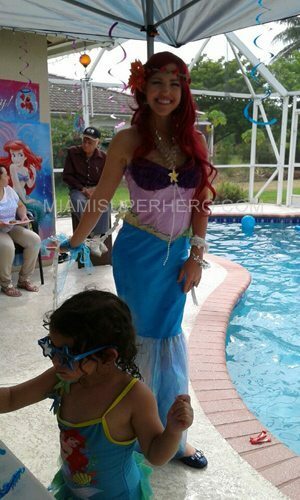 Anyways , thanks again Natali the entertainment coordinator for kids at the One Hotel in Miami Beach, Florida.